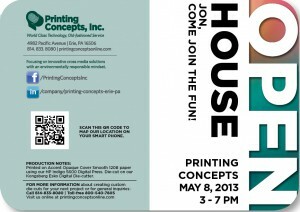 The Printing Concepts Open House in May 2013 was a huge success, and part of that success was due to the excitement and curiosity created by the invitation. Using our new ESKO digital die-cutter and variable data technology, we created an invitation that generated a buzz in the area. The more we talked to people, the more they were excited to learn how we created our invitation. The Printing Concepts Invitation featured an ESKO die-cut monochromatic front panel to offset the vivid colorful inside of the card. We included variable information for each recipient, including using personalized names, address information, and a geocoded map. We included an RSVP card that was pre-populated. If people wanted to reply online, they had an option of using their mobile devices or computers to RSVP online. 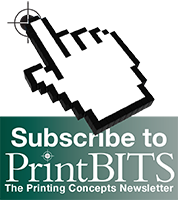 This infographic explains how and why we created the Printing Concepts Invitation. Click on the image to learn more. The RSVP card included 4 ways people could respond. People were able to fill out the card, they could reply by phone, go online to their personal website, or scan a QR code to reply via mobile device. The RSVP card was pre-populated for easy responses, and asked a simple question about their favorite shape. In making the invitation, we had three main goals in mind. How might we spark the interest of the guest? How might we make it easy for people to register and locate our office? How might we feature our new production methods in the invitation? Click on the Infographic to see how we made our invitation, or continue reading below to see some of the features we added to our invitation to make it so successful. We die-cut the word “OPEN” on our ESKO digital die-cutter to immediately spark curiosity and excitement. Not only does the word work for the Open House Event, it works as a descriptor in that when you open the invitation. Learn more about our ESKO digital die-cutter. A monochromatic front cover contrasts an interior with full color ink coverage produced with our HP Indigo digital press. People were attracted to the vibrant colors produced with our digital press, and that in turn excited us. Printing brilliant colors on our digital press opens up more possibilities to produce projects quickly and in smaller quantities. Learn more about our HP Indigo 5600 digital press. Accent Opaque 120# Smooth Cover paper gives the invitation more presence. When people hold the invitation, they can feel the thickness and weight of the paper. We used a more refined paper stock to help reinforce the integrity of the invitation, and the coming event. The heavier paper stock also reinforced the die-cut letter structure on the front. Learn more about the benefits of using different paper stocks. Scan the QR code to map our office location. We created a QR code that when scanned, would automatically open up your mobile map app, allowing you to find our office from your current location. This QR code was scanned over 300 times by the attendees. Learn more about making your projects mobile friendly. Personalized invitations with geocoded map data allows for easier planning and better attendance. We wanted everyone to attend our open house, so we provided each person a personalized map with the distance and estimated time. Having this information allowed for much easier planning by the guests, especially when they came from out of town. Learn more about using personalized information. We provided unique ways to RSVP to the Open House. Today, everyone wants more options to respond, so we offered that in the RSVP card. Call or email Printing Concepts to RSVP. In the end, over 65% of our respondents RSVP’d using their mobile device. 25% responded on their desktop computers, and 10% called or returned the RSVP card. Learn more about making your projects mobile friendly.